What did you think? Leave your thoughts below and/or a link to your blog post! Did this week’s recipe throw you for a loop. Stir-fried watermelon rind!? 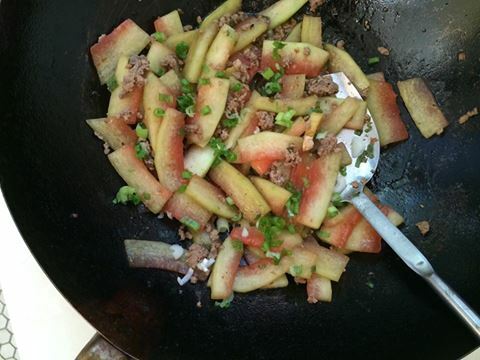 This is essentially the same recipe as the last one we did, Stir-Fried Fuzzy Melon, but with watermelon rinds in place of the melon. This is a really fun, and beautiful, recipe and its a great way to make those delicious summer watermelons go the extra mile. What did you think? Leave your thoughts and/or a link to your blog post below.